There’s always room for good ideas and good execution of those ideas in county government, but it becomes essential in a tough economy. The six winners of this year’s County Excellence Awards – Clayton, Cobb, Dawson, Glynn, Oconee and Sumter – have found ways to improve efficiency, add recreational facilities and protect their citizens. For the sixth year, the Association County Commission-ers of Georgia (ACCG) and Georgia Trend have teamed up to recognize good ideas put into action. Winners are determined by an independent panel of judges convened by ACCG. This year’s winning projects include training future community leaders, enhancing neighborhood safety, using technology for emergency preparedness, creating a park, providing a safe way to dispose of medicines and establishing a fire department. You can read the stories in the next pages. Gilmer County was awarded an honorable mention for its revision of the Gilmer-Fannin county line. The foreclosure crisis has impacted virtually every county in the state, but some have been hit harder than others. As one of the areas in Georgia most affected, Clayton County received a $9.7-million grant in federal Neigh-borhood Stabilization Program (NSP) funds from HUD in 2009 to help combat the effects of the crisis in local neighborhoods. At the national level, NSP was rolled out with specific objectives, but there were very few details about how the program should be operated at the local level. So the challenge for the Clayton County NSP team was how to best leverage the funds to address both short- and long-term local needs in an environment where the rules were still being written at the national level. The Clayton County NSP Project Office was formed in the fall of 2009 to focus exclusively on this effort. A little over a year later, it’s clear that the county got an amazing amount of bang out of the relatively limited funds that were granted. “This program not only provided assistance to combat the effects of the foreclosure crisis in our county, but it also helped stimulate our local economy,” notes Clayton County Commission Chairman Eldrin Bell. The county developed a process that resulted in the rehabilitation of 115 homes in eight neighborhoods in just over eight months. It produced 36 new homeowner families and placed another 22 homes under contract, and is aggressively marketing the remaining 57 homes to owner occupants. “We met and exceeded all of HUD’s requirements before the due date and were awarded an additional $3.8 million for NSP3, which was the third largest award for any county in Georgia,” says Bell. The program has also generated more than 1,300 new work opportunities in Clayton County and injected more than $68 million in stimulus funding into the local economy. In addition, the county was able to offer financial incentives of up to $20,000 for targeted homebuyers. “One of the most gratifying indicators of success has been the positive feedback we’ve received from existing homeowners in the neighborhoods where we’re working,” says Williams. When Cobb County began planning a series of Medication Disposal Days as part of its Keep Cobb Beautiful initiative, its main goals were environmental – specifically, to help remove dangerous pharmaceuticals from the county’s drinking water supplies and landfills. Organizers quickly discovered, however, that there was another big benefit to the program: Helping stem the abuse of prescription drugs by teenagers. Thousands of unused prescriptions sit in medicine cabinets all across the county, according to public safety officials, where they’re easily accessible to teens. While some states are very active in organizing Medication Disposal Days, Baldwin says no such event had been organized in Georgia, at least not on the scale of a 700,000-citizen county. “No one in the state had attempted something like this on such a large scale, so there were no guidelines or protocols in place at the state or local level,” says Baldwin. Collections were held at conveniently located senior centers in the county on three Saturdays last February (2010) so that all Cobb citizens would have access to a convenient drop-off point. Approximately 400 vehicles dropped off 1,425 pounds of unwanted medications at these events, followed by another 300 cars and 1,750 pounds at a subsequent event in October. Baldwin notes that the out-of-pocket cost of the program is only about $1 per pound of disposal. But when you factor in the cost savings of donated facilities, supplies, marketing, communications and staff time, the net cost is around three cents per pound. “This program is an affordable way to solve a critical problem,” she says. The next Cobb County Medication Disposal Days event is scheduled for March 26. What’s more, the impact of the program’s success is now reaching beyond Cobb County, as the Georgia Drug & Narcotics Agency, along with the Federal Drug Enforcement Admin-istration, is planning to implement a statewide disposal program. In 2008, Dawson County officials launched an initiative called In Touch With Your Dawson County Govern-ment, a program seeking to better connect citizens with their elected and career officials, but it didn’t take long for those officials to realize one group was not as engaged as it should have been. So a special program, called B.E.S.T. (Building Educated Students for To-morrow) was begun, with elected officials and department heads visiting classrooms to explain how all county services work and getting teens into courtrooms and jails on field trips for firsthand experiences observing the machinery of government in action. “After letting the students see what the different aspects of government do, we held a mock election and they were able to run for the office of their choice,” says Brooks. “They did have some interesting campaigns.” One girl who ran for sheriff had as her slogan “I’m Not Going to Take Any Crap Anymore.” She won. Dawson County Commission Chair-man Mike Berg taught two of the local government civics lessons and discovered the teens started slowly, then latched on to their subject. Students conducted mock arraignments, discussed community needs, made suggestions on infrastructure improvements and are set to watch a real trial this year. They took field trips to a fire station and operated the Jaws of Life hydraulic equipment used to extract crash victims from their vehicles, and they learned the legal intricacies of zoning issues. The classes and field trips are conducted over 25 days, and Berg is hoping the students will one day be motivated to run for office themselves. “If you look across the landscape of Georgia, local government is an aged government,” he says. When Emerson Chew describes some of his duties, he at first sounds like an intelligence officer planning a military operation, using something called LiDAR, or Light Detection and Ranging. The $465,000 LiDAR system was purchased via the county’s Special Purpose Local Option Sales Tax (SPLOST) fund and was installed in 2007 in an effort to respond to requests from engineers for help in developing more accurate information on the lay of the land. “Given our lack of elevation relief, we really needed updated information so we could see what the topography was like,” says Chew. County officials say the LiDAR investment has already saved money on survey and engineering costs. Knowing where the water will flow is critical to local planners and emergency personnel who need to know how and where the water will go in case of a hurricane or flooding. And there is the economic development factor inherent in such knowledge. “We are working with our developers who invest in our community and want to tap into our system,” says Howard Lynn, who retired as chairman of the Glynn County Commission this year. “That’s another way the taxpayers have already received a tremendous amount of benefit from the LiDAR system. We had a lot of drainage problems, and we really didn’t know where these drainage problems were; we had to guess. Now we can photograph these problems.” Then improvements can be made in the drainage system, he says. The county government installed the LiDAR system after lengthy discussions with county engineers and in public hearings. “It kind of surprised me the amount of general public who wanted to see what we were doing and how it actually works,” Lynn says. Oconee County has long promoted its high quality of life as a major selling point to potential new residents and businesses, as reflected in its theme, “A great place to live, work and play.” One of the essential elements to maintaining this quality of life is the county’s outstanding park system and recreational outlets. The newest addition to Oconee County’s quality of life initiative is Oconee Veterans Park, a 197-acre park that promotes both indoor and outdoor recreational activity. The park’s phased opening started with the dedication of the Oconee County Veterans Memorial on July 4, 2008. Located prominently at the park’s entrance, the memorial is one of the largest veteran memorials in the southeastern United States. Beyond the black granite memorial adorned with the seals of each military branch, flanked by seven flagpoles and fronted by an ever-flowing water fountain, is the sprawling park itself. It features four lighted soccer/football fields and four lighted softball/baseball fields, eight lighted tennis courts, a 1.25-mile paved walking path, picnic shelter, playground and community and senior centers. Within the community center is an indoor track, fitness area, gymnasium and meeting rooms. And the senior center provides 11,000 square feet of indoor space for more than 20 different senior citizen programs and services. Gentry says the new park has met the county’s specific needs for regulation-sized soccer fields, youth baseball and softball fields, lighted tennis courts, and additional indoor gym space to support the county’s growing demand for these types of recreational facilities. “Oconee Veterans Park has produced measurable results and promises to provide long-term, sustainable benefits for the community,” says Gentry. During these times of tight budgets, the county was able to minimize the fiscal impact of the new facility by phasing in the opening. “This allowed for the gradual increase in expenditures to operate Veterans Park and the new senior center,” explains Oconee County Chairman Melvin Davis. The phased-in opening, coupled with a departmental reorganization, allowed the county to open the park and facilities while adding just four maintenance workers, one office assistant and eight part-time program supervisors. For years, Sumter County’s firefighting duties in unincorporated areas were carried out by volunteers who selflessly donated their time to battle flames, saving buildings and lives. Volunteer firemen have long been storied figures in American lore, but they do not impress the Insurance Services Office (ISO), whose ratings are used by insurance companies to set costs for fire insurance. In Sumter County, the ratings for areas out in the country were abysmal, making fire insurance costly. A rating of 3 was considered acceptable, with insurance costs rising dramatically for higher numbers. So on Sept. 22, 2009, the Sumter County Commission voted to establish a countywide fire department to become operational on Dec. 1, 2009. The vote also called for the county services now being performed under contract with the City of Americus to be replaced by Jan. 1, 2010. It was an ambitious startup schedule, one made possible thanks to the novel use of prison inmates as firefighters and the readily available buildings that could be easily transformed for new uses. “Empty government buildings in a local recreation park were converted and refitted to house fire stations, fire engine bays, training facilities and offices,” says Taylor. And the inmate firefighters? “They train harder and work harder than most paid staff because it is such a great opportunity for them,” says Brent Williams, chairman of the Sumter County Commission, in an email response. “… I believe that our model provides an opportunity for inmates to serve the public in a needed capacity and teaches them job skills to be used in life once they are released.” In fact, one inmate has since been released and is working as a fireman in another community. The inmate firefighters are on duty 24/7 and reside at their fire station as part of their incarceration. “To our knowledge, our model has not been used in its entirety in any of the 3,108 counties in the United States,” says Williams. 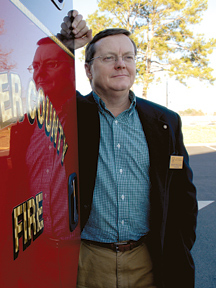 In its first year, the Sumter County Fire Department produced 22 total stations, with four fully staffed, and 18 substations housing equipment, accor-ding to documents provided by Taylor. Funding for the project came from use fees and loans from the Association County Commissioners of Georgia’s (ACCG) Lease Purchase Program.